The Kingdom of Morocco is situated on the north west tip of Africa, with the Atlantic ocean on one coast and the Mediterranean on the other. Morocco is easily accessible ; it is only 14 kilometres away from Europe across the straits of Gibraltar. Morocco lies within the Greenwich Time Zone and operates on Greenwich Mean Time (GMT). Morocco covers an area of 710,850 square kilometers, with 3,500 km of coastline. 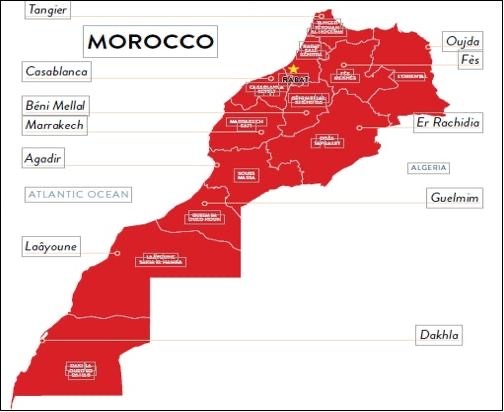 Moroccco has two mountain chains: the Rif Mountains are in the north of the country, while the Atlas mountains, higher in altitude, stretch through the interior from Fes to Taroudant. The Sahara desert begins at Tiznit and continues south. The weather is mostly Mediterranean, but is more arid and desertic in the Deep South. The nearness of the sea and the Rif and Atlas mountain ranges guarantees a pleasant climate all year round. Arabic is the official language but local dialects are spoken in the Mountain regions (Rif and Atlas). French is the most commonly used second language, followed by Spanish and English. The unit of Currency is the Dirham (DH). One US Dollar is worth 7.14 dirhams (as of March 26th, 2008). One dirham is worth 4.4 Baht. Morocco has one of the oldest monarchies in the world, founded in the 8th century by the Idrissides. It is a Constitutional Monarchy and a multi-party democracy. His Majesty King MOHAMED VI (pictured) is Head of State since July 30th 1999. His Majesty King Mohamed VI is undertaking a vast economic and social development programs to meet the needs of the new generation by promoting education, women emancipation, employment and fighting poverty. The Government is composed of the Prime Minister and the Ministers. It is accountable before the King and the Parliament. The Government is led by Mr Driss Jettou, Prime Minister who took charge since October 2002. The Parliament is bicameral. It is composed of an elected House of Representatives (325) and elected Chamber of Counselors (300). The Judiciary System is independent from the Legislative Branch and the Executive Branch. Judges are appointed by His Majesty the King upon the recommendation of the Supreme Magistrature Council. The Constitutional Council is in charge of controlling the constitutionality of laws and the regularity of legislative elections and referendum operations. Morocco is a multi-party democracy. In the wake of the elections held in 2002, the following parties are represented in the parliament: Socialist Union of Popular Forces USFP, Constitutional Union UC, National Rally of Independents RNI Popular Movement MP, Social and Democratic Party, Istiqlal Party, National Democratic Party, Party of Progress and Socialism, Democratic Union. The next general elections will be held in 7th September 2007.